Unlike the instruments that have been previous taught or examined in the music of India, the harmonium is one of the most frequently used instrument that has no Indian origin. 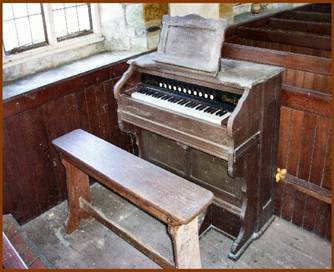 The harmonium was actually a European organ that was used in churches during the medieval time frame. The look of the harmonium then was almost similar to a piano. There is was a huge number of keys, a chair to sit down, and a foot pump for the air. This way, the musician could play the harmonium with both hands. European music requires this, it is mostly harmonic through the use of chords. A chord is when three or more notes are played simultaneously. Figure 1.1 shows a picture of the harmonium in England. When the British came to India in the 18th century, they brought their harmoniums also. Although the foot pedal was still retained, the hand pumped version was introduced. When the harmonium came across to North Indian musicians, they immediately favored this instrument for few reasons. When the hand pumped version came out, it did not require foot pedals. For an Indian musician, it was discipline and practice to sit on the floor. Thus, this format of a floor organ worked well. Secondly, the harmonium was able to go with the flow of the voice pretty well. Thirdly, it was much easier to learn than sarangi. Sarangi is a bowed instrument which was used to accompany vocalists. However, it was very difficult to play. Even though one hand was required to pump air, it was not a problem, because Indian music does not have chords. Since Indian music is primarily melodic, only hand was needed to pump and one hand was needed to play the melody. Despite its European origin, the instrument has found its use really well in an Indian musical setting. With the exception of South Indian music, the harmonium has been used in almost all genres of music in India. The harmonium is not strictly limited to Indian styles. Western forms, in terms of chord changes, are currently integrated into the North Indian forms of music. Chord progressions introduce a different form of modality. Chord progressions, however, will not be found in North Indian classical or semi classical. BELLOWS- the bellows is a series of metal tongues which allow the air flow. The bellows must be pumped by hand allow air to flow into the harmonium to produce sounds. The left and right ends of the bellows usually has a metal bar or latch. These latches are on both sides to assist right and left handed players at their comfort. More about left and right handed positions in the next chapter. KEYBOARD- This is the most important and unique feature of a harmonium. The keyboard allows one to play melodies. Each key, when played, produces a unique sound. The structure and format of the keyboard resembles a piano. The function and theory will be discussed in great detail in the second unit. MAIN STOPS- Main stops are the bigger knobs on the harmonium. The purpose of the main stops is to direct air flow. Selecting a certain number of stops in a certain order can affect how the sound comes out. If no stops are pulled out, then no sounds will be produced, regardless of the amount of air being pumped into the harmonium. There are a few things that your harmonium might not have. Stops are one of them. If you do not have stops, don’t panic. You will still get sound, but the whole harmonium will be having a uniform sound. DRONE STOPS (not shown) – The function of these stops are to produce a constant sound of a single note. Again, not all harmoniums will have this feature. COUPLER (not shown) ­­– Some harmoniums have this special feature of the coupler. Whenever a key is played, the same key one octave lower will be played. This will allow a richer sound. If the coupler knob is pulled out, then the coupling feature will be disabled. SCALE CHANGER (not shown) – Some harmoniums will have a scale changer which will change the pitch and positioning of the keys. The scale changer, although a nice tool, often causes problems for the harmonium. 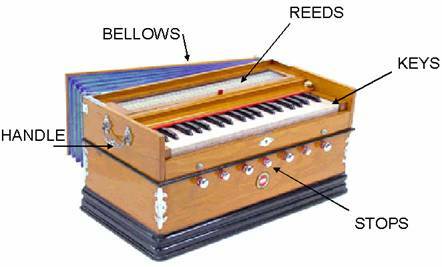 Even though you may not know anything about how to exactly play the harmonium, do practice getting some sort of sound by opening the bellows, pumping it with one hand, and get some sort of sound by pressing the keys from the keyboard. If you have stops, use the main stops and see how selecting stops can affect the air flow as well as the sounds. Experiment the changes when the coupler feature is active or disabled. If you have a scale changer, however, do not experiment with that. Many newcomers to the harmonium do not know how to work with changing the scale and the chance of breaking it is really good. It is very useful to know how to operate the harmonium, before you learn anything to play it.